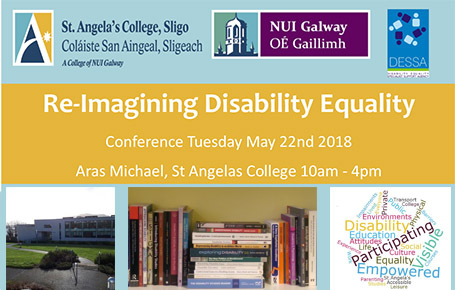 The Re-Imagining Disability Equality Conference is taking place on Tuesday, May 22nd 2018 in Aras Michael, St. Angela’s College, 10am - 4pm. Disabled people continue to experience inequalities in Ireland despite developments in strategy, policy and law. There is an opportunity to act now, in light of the NDIS and the CRPD, to ensure that disabled people can be visible, empowered and participating in every sphere of public and private life in Ireland. Hosted by the Department of Nursing, Health Sciences and Disability Studies, St. Angela’s College, the purpose of the conference is to facilitate a discussion on the need for a robust theoretical framework to underpin work done for and with disabled people in Ireland. Building on the Re-Imagining Disability in Leitrim Seminar (May 2017), the event will provide an opportunity to consider a better way of working, led by disabled people and with the capacity to deliver on the letter and the spirit of the National Disability Inclusion Strategy 2017-2021 (NDIS) and the United Nations Convention on the Rights of Persons with Disabilities (CRPD).